Q: Could you give us a brief background to TETRATAB and how you found yourselves offering a new Military version of your products? A: TETRATAB Ltd is a UK company originally founded in 2007 to provide specialist rugged mobile computing devices to the police and emergency services. In conjunction with Intel, TETRATAB have continued to develop a fast growing range of innovative products and accessories – still aimed directly at emergency service users – but with a growing customer base in other ‘front-line’ rugged users such as ‘orange light’ and local government. The product range is agile, rugged, secure, highly affordable and totally fit for purpose. The launch of our new CASEPAD lightweight and slim line IP 65 rugged Windows 8.1Pro tablet now provides us with the ideal rugged device for military markets and we are currently developing a range of specially upgraded devices for military customers. TETRATAB have delivered secure mobile workforce tablet solutions internationally in particular as part of ‘blue light’ and border reinforcement for both the European Union and through the UNDP. In the UK we have delivered large scale mobile data roll-out projects to police forces or via telecommunication or managed service or software partners. With many years of specialist experience within our team, we have a first-hand understanding of secure mobile data device provision including TETRA. Whilst all product design and development is undertaken at TETRATAB UK, device manufacture and provisioning for TETRATAB is supported by our Intel manufacturing partners in Europe. 8” casepad. Photo: © TETRATAB. TETRATAB’s product range is cutting edge in the handheld smartphone and computing tablet space. In partnership with Intel, TETRATAB use the latest processors and will follow the development of personal computing devices and personal processing. By using radio modules from world class manufacturers such as Motorola, Huawei and Sierra Wireless, TETRATAB products can constantly develop and indeed be retrofitted as bearer technology evolves and standards change. With the introduction of our new CASEPAD rugged tablet range – we were quickly approached by specialist military users wanting to exploit the rugged but compact design of the CASEPAD units for active deployment. As a consequence we are now developing specialist military versions of the CASEPAD to deliver higher levels of encryption, higher levels of MIL hardness and additional ‘specialist’ functionality such as ‘TEMPEST’ certification and body worn mountings. Q: With programmes looking at more effective individual war fighters, lightening the load and more effective equipment have come to be buzz words at the moment, how are your products able to help in that area? 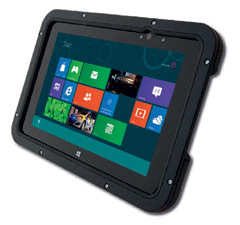 A: The CASEPAD is one of the thinnest, lightest and most ultra-portable rugged Windows 8.1 Pro tablets available – being almost the same size as non-rugged ‘consumer’ tablets – yet it is IP65 certified water and dust-proof and tested to withstand a 1metre drop. For ultra-rugged users we can also offer a totally ‘watersafe’ nano-technology build – which allows the tablet to be completely immersed in water for prolonged periods and still be totally serviceable. We also offer an optional MIL Standard case which increases the drop height to 1.8 metres. 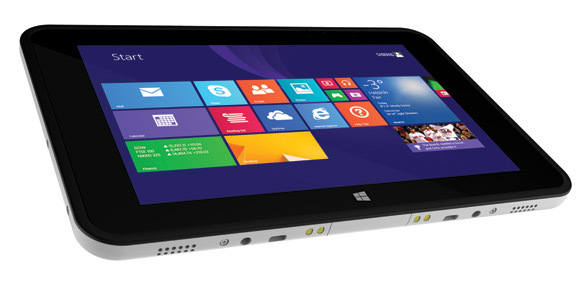 With its latest generation Intel ‘Quad Core’ processor, the CASEPAD is one of the only Windows 8.1 tablets with a 10 hour full shift battery which is easily accessible and swappable – so users can take a spare lightweight battery for extended shifts away from power charging and support technicians do not need to send the whole tablet away for repair or battery replacement as with most of other ‘sealed unit’ tablets. The 8” model is compact enough to fit into a trouser map pocket or ballistic jacket making it truly ‘hand portable’ – but with an effectively large screen for heavier data input tasks. The 10” tablet offers an even larger screen experience and both models have optional attachable rugged keyboards which are essential for heavier data collection tasks – or ‘in vehicle’ use. The attachable backlit keyboard unit is also IP65 rugged rated and also has an integral spare battery and extra USB3 connectors. The CASEPAD is a true ‘enterprise / professional’ grade device with a guaranteed 4 year availability – so customers can confidently plan longer term tablet deployments avoiding short ‘consumer fashion’ device lifecycles. Side by side against the rugged competition, the CASEPAD is almost half the thickness, half the weight and half the price! Q: Major problems are being faced in two areas by all military personnel, one is the problem of carrying effective power capabilities and the other is interoperability; this is a problem you would have faced in your work with emergency services, and in particular security of data and information? A: The new TETRATAB ‘hexagon mount’ fixing solution is capable of mounting the CASEPAD to backpacks, or other ‘front line’ clothing, thereby giving a slim line and ‘click lock’ fixing. This hexagon mount can be ‘passive’ (i.e. fix only) – or ‘active’ – where we can connect the CASEPAD tablet to body worn secondary power supplies and additional USB accessories. Q: Interconnection and how you connect the product into vests and into existing infrastructure is a problem faced by a lot of innovative product when going out into the defence field how have you overcome this problem? A: One of the great attractions of the CASEPAD is the highly flexible ‘DEMOUNTABLE’ docking solutions. Our totally flexible ‘Hexagon Mount’ with ‘active’ or ‘passive’ options can be fitted onto any type of surface – in vehicles, aircraft, buildings, on machinery, heavy weaponry or onto personal clothing and equipment. The whole CASEPAD range can be securely and safely ‘locked’ whilst on the move in compliance with health and safety and electronic emission standards – but can be almost instantly demounted for rapid deployment away from the vehicle. Ranging from a simple low-cost docking holster with cigar socket power charging right up to a complete video or multi-camera ANPR solution. The universal TETRATAB desktop docking unit allows instant one-click connection of the tablet to office keyboards, larger display screens, mouse pad, printers and Ethernet LAN and audio speakers. Q: Where do you see yourselves in a year’s time and where can people see your product for field trials? A: The rugged CASEPAD and demountable docking options can be trialled now – so customers should contact TETRATAB direct via our website www.tetratab.com. The additional specified military grade devices are currently under evaluation by ‘specialist’ military partners and we will have these available for wider inspection by early Autumn 2014. However, any military customer requiring custom specification builds or special ‘operational’ requirements should also contact us via the website so that we can discuss these requirements. Our current military partners have planned a series of highly specialised trials to simulate operational conditions in the field – in particular high humidity and high temperature jungle environments. The production devices used in the tests will be put through their paces not just with regard to their ruggedness but also for real world usability. This includes in-field operation, reporting and “in-compound” use. Special care is taken with regard to all device emissions, data security and stun and kill. Within the year, we anticipate to be in our first international large scale international military roll outs and have an approved computing platform suitable for many varied military use cases.